Posted: December 31, 2010 6:19 p.m. Updated: January 1, 2011 4:55 a.m.
University of California Berkeley running back and Valencia graduate Shane Vereen, right, breaks a tackle on Sept. 12, 2009 in Berkeley. Vereen plans to enter the 2011 the NFL Draft. 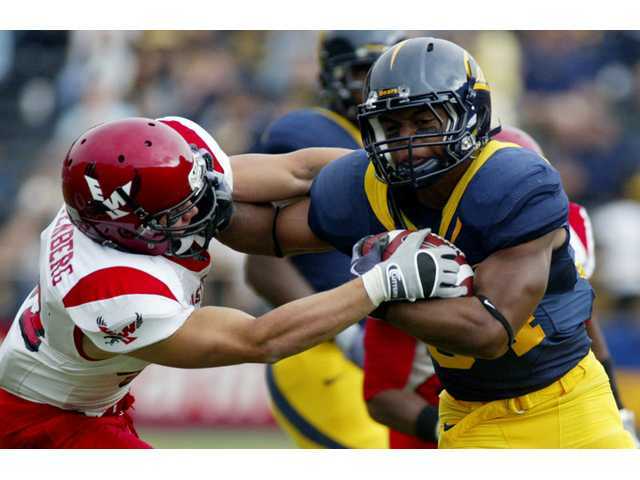 Valencia High graduate and University of California Berkeley running back Shane Vereen has decided to forego his senior season in college and enter the 2011 NFL Draft. Vereen told The Signal on Friday that despite the possibility of a Heisman Trophy candidacy and the opportunity to raise his draft stock by playing one more year of college football, he was ready to make the jump now. "I think the big part of my decision is I graduated early. 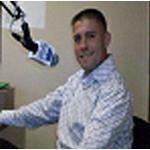 I graduated in 3 1/2 years," said Vereen, who graduated with a bachelor's degree in communications. "The fact that I was done with school, had a decent season and was healthy put myself in a position to play in the NFL." The 21-year-old informed Cal head coach Jeff Tedford of the decision last Sunday. "It was very difficult," Vereen said. "I love Cal with everything I have. I had the best 3 1/2 years anyone could have there. ... I had to keep my dream (though). Since I was 7, I wanted to play in the NFL. I saw the opportunity to accomplish that, and I went for it." Vereen was an All-Pac-10 second-team selection in 2010 for a disappointing Golden Bears team that finished 5-7 and out of a bowl game for the first time since 2002. He led Cal with 1,167 yards on 231 carries with 13 rushing touchdowns. He also caught 22 passes for 209 yards with three receiving touchdowns. ESPN NFL Draft expert Mel Kiper Jr. ranked Vereen No. 5 nationally among junior running backs. Vereen has been told that he might be selected in the second or third round of the draft. But it's early, as the draft isn't until April, and he has until that time to up his stock in workouts. He acknowledged that another year in college could have boosted him higher in the draft, but he added that there are no certainties. "The reason why I'm going to the NFL is not the money," he said. "If I'm good enough, I'll make the money." Vereen was a three-sport athlete at Valencia High, playing football and basketball and running track and field, but his star shined brightest on the gridiron. He is widely regarded as one of the best football players in Santa Clarita Valley history after three-plus years on the Valencia varsity team. Vereen rushed for 3,980 yards and 91 touchdowns, made an appearance in the 2004 CIF-Southern Section Division II championship game and had a 354-yard rushing performance that once made him the valley's single-game rushing-record holder. He burst onto the scene at Cal last season after taking over for injured starting running back Jahvid Best. Vereen rushed for 952 yards on 183 carries and scored 12 touchdowns on the ground. He also caught 25 passes for 244 yards with two scores through the air, earning an All-Pac-10 Honorable Mention honor. Vereen is represented by Ryan Williams under the Athletes First agency. Athletes First also represents NFL stars Ray Lewis, Mark Sanchez, Aaron Rodgers and Hart High graduate and Oakland Raiders quarterback Kyle Boller.